Okay let's be honest, you're not networking for your health, and you are networking because you want to gain something, right? You want to increase sales, increase opportunities, grow your business, and build your network of connections or some other positive reason for networking. That is all true, but the key is when you are networking either live or virtually, it is essential not to have the networking be about you. Let me be real clear cowboys and cowgirls, it' ain't about you. Let's be honest and totally transparent- people who network with you want to know what is in it for them. If that is true then hello -- make it about them. Many times when I've met people at networking events, they spend several minutes blathering on about themselves, never asking me one question about me what I do or what I want. Many times when I've spoken at companies national meetings I will ask from the stage, where are all the people from Dallas? All the people from Dallas will hoot and holler and raise their hand, and probably no surprise to anyone reading this; they are all sitting at the same round table. It is the same no matter which group I call on. It baffles me. If you work in an office why would you go to your company's national meeting and sit with people you work with every single day? I know that one of the reasons people feel more comfortable with people who they know. But let's face it the truth is it entirely defeats the whole purpose of networking. You already network with the people from your office, and you already know them. 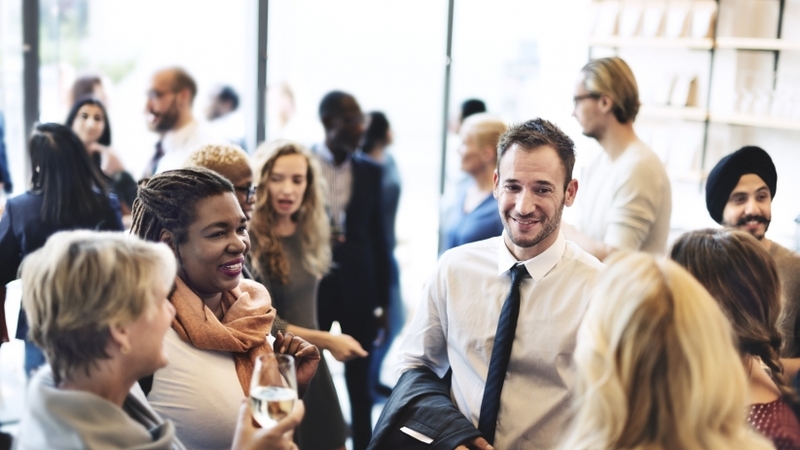 The goal of networking is to meet new people to make new connections and to start to build a valuable network both inside and outside your organization. When I ask people who are going to some networking event what their plan is for networking they look at me like a deer caught in the headlights. You know what look I mean. Not only do they give me a confused look, but they don't know what I am saying. What do I mean by having a networking plan? I believe in anything you do, if you are trying to achieve a result, people have to know what you want your results to be. You should have goals and objectives for networking, and when you go to a networking event, you should have a plan. I have met many people at networking events that were shy or socially awkward. I have also met many people at networking events who are overbearingly outgoing or obnoxious or drunk, or just all three. As Napoleon Hill once said "The first step in getting people to like you is by liking them, and expressing it in the tone of your voice, in a pleasant smile when you are speaking to others, in a sincere desire to be helpful to others whether they deserve it or not." Most people do not know how to have meaningful conversations. The idea of having any conversation is to make a connection and to build rapport with the other person. There seem to be some people who have a tremendous love for hearing themselves talk about their favorite topic- themselves. If they closed their mouth, their tongue would beat their brain to death. These folks suffer from a disease I referred to as "egotists giantitus" or "giant ego syndrome." Let's face it; there is a thin line between confidence and arrogance. As a networker I want you to be confident and polished and articulate, but I do not want you to be arrogant. Most people do not like arrogant people, including other arrogant people, which I find ironic. So the goal in networking is to 1) talk less not more 2) to ask more questions 3) to engage and draw out the other person. Remember it is a conversation, not a dictation, a dialogue, not a monolog.